Nursing Home Abuse & Neglect - Wisell & McGee L.L.P. Are you constantly leaving the Nursing Home or Assisted Living Facility from visiting a loved one, wondering if something is wrong. Does the smell of the home alone tell you that the staff at the Nursing home just doesn’t care, or aren’t doing their job? Do you look around for help when you visit, but are unable to find any staff members to assist you. Do staff members complain to you that they are overworked or have to care for too many patients? That they just don’t have the time to do as much as they might like to take care of your loved one? Do you find your complaints to the nursing manager fall on deaf ears. Do you find your loved one soiled, left unwashed, or sitting in their own urine and feces? Does the entire corrider smell the same. Does your loved one have pressure ulcers or bed sores? Do you feel like this shouldn’t happen, even though staff members tell you that all old people get them because they lay around all day and because their bodies are old? This is not true! Call us. We will discuss your situation and determine if we can help you to help your loved one. The loved one may be your parent, a spouse, a sibling, or an aunt or uncle. They worked hard their entire life. They contributed to your family, to their career, to society. They paid taxes. They may be on Social Security, Medicare, Medicaid. They deserve to be taken care! If they are not, then something needs to be done. Placing a loved one in a nursing home is a very difficult decision. When a nursing home facility is finally selected, the hope is that your loved one will receive the care and attention they deserve. Sadly, at times, that does not happen. 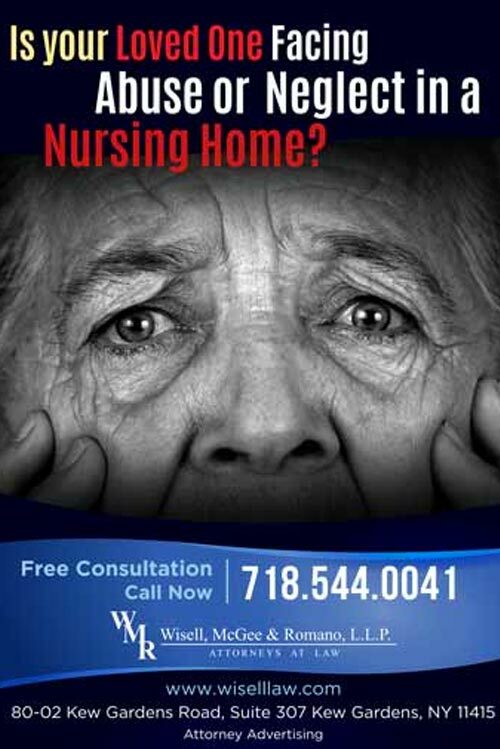 Frequently, residents in nursing homes are severely injured. Due to the absence of a comprehensive plan of care, patients fall from their beds, develop bedsores and suffer from malnutrition. Residents that suffer from Alzheimer’s and dementia sometimes are ignored by the staff at facilities where they live. At a vulnerable time in their life, older people are often left alone and are uncared for. That often results in injuries that compromise an already delicate situation. If you believe a loved one is not receiving the care that the law requires, contact our office to discuss your concerns. When your beloved elders are unable to care for themselves, you look to the medical professionals in nursing homes to care for them. You place your trust in the nurses, doctors and aides that they will make sure our grandmothers, grandfathers, uncles and aunts are provided for. When that trust is broken and your loved one is injured due to the negligence of a member of the nursing home medical staff, you deserve justice!